Need to create a comfortable temperature for guests in a commercial environments? Outdoor heating is great for accommodating guests in restaurants, event venues, and exterior lounge spaces. Placing floor standing heat lamps with tabletops in dining areas means that they can be used well into the night when it starts to get cold. Our commercial outdoor heating solutions are ideal for warming people up in the spring, autumn, and winter, when people might consider going inside. This allows a variety of businesses to operate for longer or make more room in indoor lounge areas. Outdoor heating fixtures, or gas patio heaters, accommodate customers by creating comfortable temperatures for dining and socializing. Why choose these propane heat lamp stands? These outdoor heating solutions warm an area of 10 to 12 feet in diameter with up to 48,000 BTUs of energy. These gas patio heaters have a variable control dial to set the ideal temperature. 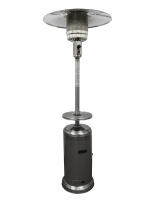 Our steel heating fixtures use common 20lb propane tanks and include a regulator. These exterior heat lamps can burn for 8 to 10 hours on the high setting from a single refill. Easily change out tanks with the easy-access door design. Each heating floor stand has a small adjustable tabletop for holding glasses and drinks. This ledge is a great place to supply guests with party favors or feature salt and pepper shakers where everyone can see them. The commercial grade patio heaters also feature wheels for mobility. While these fixtures are made of steel, they can be wheeled out to dining areas when they're needed. Each exterior heat lamps has safety features to ensure that they can be used in crowded exteriors. They have an anti-tilt design that prevents them from falling over. The included thermocouple keeps the temperature from rising too high and damaging the unit. We offer patio heater covers for protection from the elements. Restaurants and event venues can keep the stand outside, instead of wheeling it inside each night. 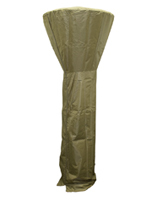 These covers are made of durable, weatherproof polyester to protect metal exteriors and propane tanks from rain and dust. A heavy duty zipper ensures that this protective layer is securely closed. Looking to create the ideal exterior lounge area? Browse our outdoor TVs and all-weather flatscreen enclosures to bring your terrace into the digital age. We offer weatherproof flat panels as well as enclosed mounts for featuring entertainment and promotional material outside. Shop our expansive catalogs for more surprising commercial displays and fixtures.